Kakadu National Park is a UNESCO World Heritage Site that is located approximately 149 miles south of Darwin in the Northern Territory. Covering nearly 7,722 square miles, it is the biggest national park in Australia. It extends from the rocky and stony inland plateaus and ridges in the south through billabongs , floodplains, and valleys to the coastal wetlands in the north. The southern hills and cliffs are made of ancient volcanic rocks and sandstone. These cliffs on the Arnhem Plateau are up to 984 feet high. This is a region that consists of rivers and waterfalls. The park’s lowlands and floodplains make up about 80% of the surface area. They are covered in woodlands and forests. The northern areas consist of estuaries, wetlands, and tidal flats, providing a year-round refuge for water birds. These varied landscapes in one of Australia’s most iconic national parks provide a home to a large variety of endemic animals and plants. A quarter of the country’s freshwater and estuarine fish live in Kakadu National Park, as do more than a third of its bird species. Many of the animals in the park can’t be found anywhere else in the world. Examples of high-profile mammals are Kangaroos, Wallaroos, Wallabies, Quolls and Flying Foxes. More than a hundred reptile species live in the national park, many of which are snakes. Kakadu National Park is also home to two crocodile species: Freshwater Crocodiles and Estuarine or Saltwater Crocodiles. There are a stunning 10,000 crocodiles in the park. Plant life is abundant as well. There are more than 2,000 species. The variation between geology and landscapes provide habitats to a wide range of plants. Typical plants for Kakadu National Park are Speargrass, Pandanus, Kapok Bush and Darwin Woollybutt. Darwin is the nearest city to Kakadu National Park, situated in a vast region that is partly owned by Aboriginals. 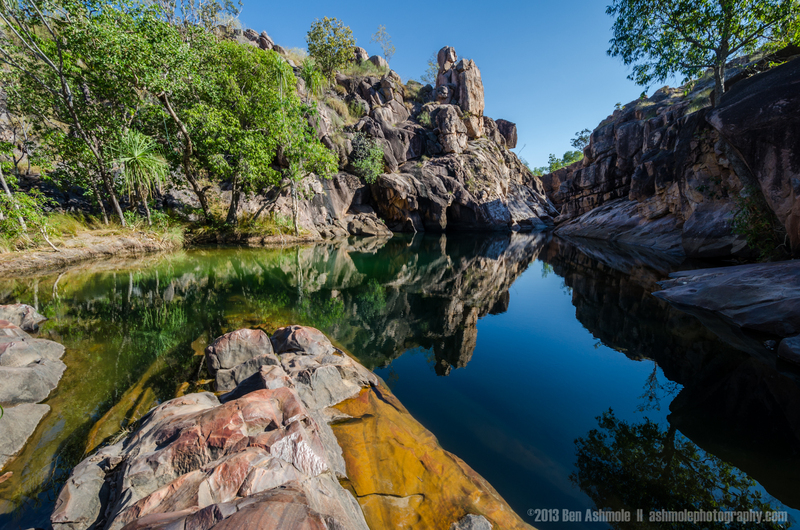 It is part of Arnhem Land, which encompasses the entire north of the Northern Territory. This enormous land consists of savannah-like woodlands, estuaries, rocky cliffs, floodplains, and wetlands. The Kakadu area has been inhabited for more than 40,000 years. More than 5,000 Aboriginal rock art sites are known in the park, which provide an illustrated history of Aboriginal culture in the span of nearly 20,000 year. 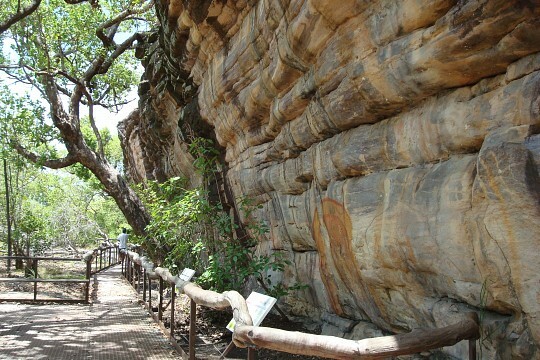 Kakadu National Park has the world’s highest concentration of Aboriginal rock art. The Aboriginal people in the north of the park are known as “Bininj”; the people in the south as “Munnguy”. This enormous wealth of cultural history, in addition to the park’s immense natural value, was the reason Kakadu National Park was declared a UNESCO World Heritage Site. About half of the Kakadu area is now owned by Aboriginals, while the other half is currently being claimed by them. Many of them keep true to their traditional beliefs and customs. Approximately 500 Aboriginals still live in the park. 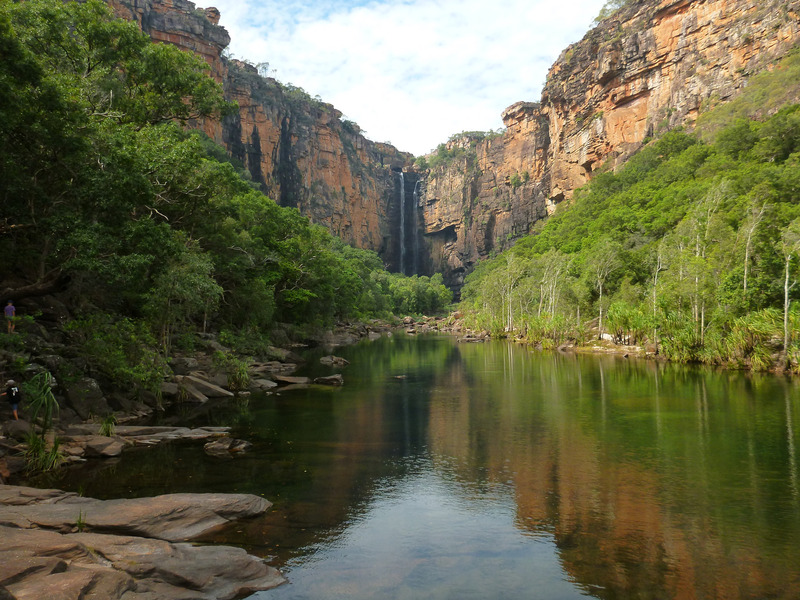 The name ‘Kakadu’ is derived from the word “Gaagudju”, the name of an ancient Aboriginal language that was spoken in the northern parts of the park. In 1965, it was suggested to create a national park in the area. It was a time when the people of Australia became more aware of the importance of preserving natural landscapes and historic sites. Kakadu National Park was established in three stages, between 1979 and 1991. 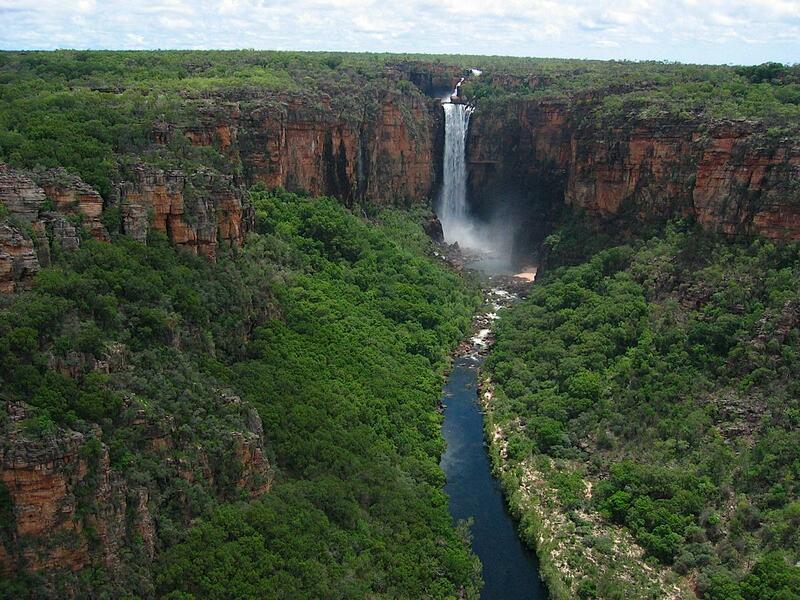 Kakadu National Park is famous for its bodies of water, ranging from wetlands and river to billabongs and waterfalls. Water has shaped much of the present-day landscape in the park. Especially the waterfalls are spectacular, attracting huge numbers of visitors each year. Billabongs that are crocodile-free provide excellent natural swimming pools. In the dry season, when the rivers shrink to small streams, visitors can get close to the waterfalls, while from November to May the waterfalls thunder down the cliffs and are at their most impressive. The national park's most famous waterfall is Jim Jim Falls. This spectacular waterfall lies on Jim Jim Creek close to the eastern border of the park and is listed as an Australian National Heritage Site. Jim Jim Falls' drop varies between 459 feet and 656 feet. In the dry season the waterfall can be reached along a 60-kilometer gravel road, the last section of which is challenging and only accessible by 4WD. During the dry season the waterfall dries up almost completely. The waterfall is at its most breathtaking in the wet season. 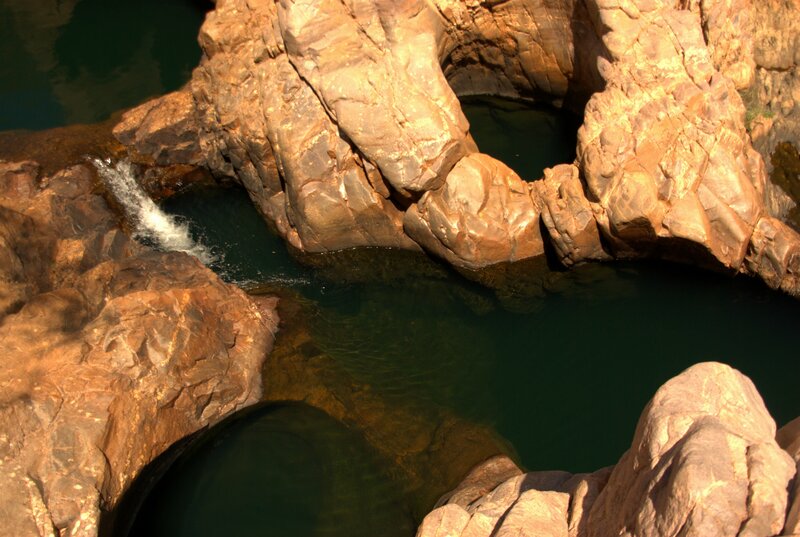 A major landmark in Kakadu National Park, Jim Jim Falls is set in the Arnhem Land escarpment with its recognizable red ochre colors. 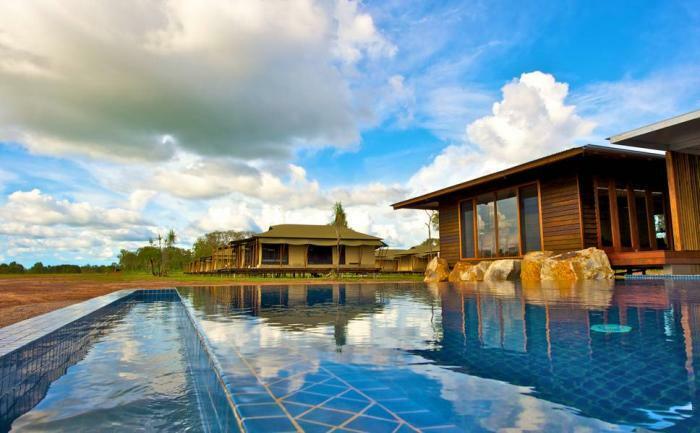 The water in the billabong is perfectly clear and white sandy beaches surround the plunge pool. A suggested way to see the waterfall is by hiking. The Jim Jim Pool Walk is a strongly recommended hike for all people who visit the park. It leads through monsoon forest and runs over boulders and rocks towards the plunge pool where the Jim Jim Falls thunder down. The deep pool is surrounded by magnificent 150-meter cliffs. In the dry season the entire area around the waterfall can be explored on foot. A great, but challenging, hike is the extremely steep Barrk Marlam Bushwalk that runs through the rocky landscape of the Arnhem Land Plateau. Twin Falls are two waterfalls located near Jim Jim Falls. This split waterfall on the Alligator River cascades 492 feet down an impressive cliff. These waterfalls also shrink to barely a trickle in the dry season. However, in the wet season they are marvelous. The very best way to get close to the Twin Falls is by boat shuttle. The Twin Falls Gorge Boat Shuttle ferries visitors to the base of the falls. A boardwalk allows more exploration and offers fantastic views of the cliffs and waterfalls. There is a sandy beach as well, perfect for a picnic. These falls are also listed as an Australian National Heritage Site. Both the Jim Jim Falls and Twin Falls can be accessed by 4WD. 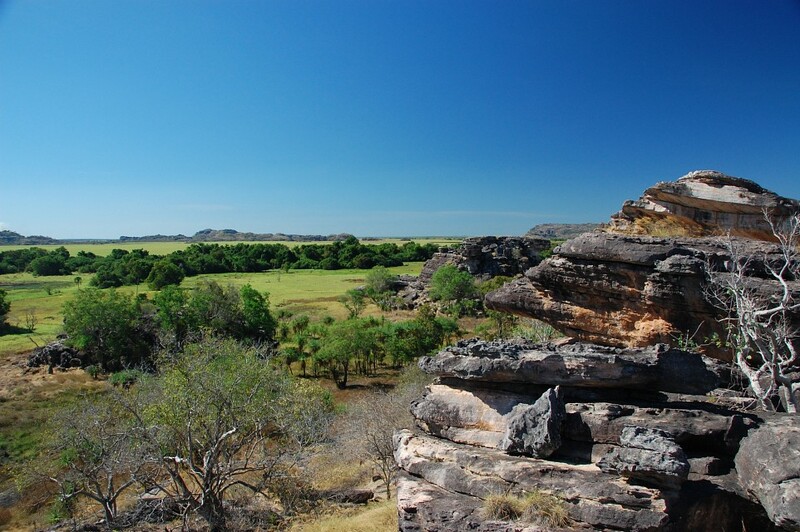 A great and popular way to see them from a different perspective is by taking a scenic flight over the Jim Jim Area. More waterfalls can be found and seen in the Mary River Region in the south of Kakadu National Park. Gunlom Falls are located on Waterfall Creek and are a fine combination of beautiful waterfalls and a relaxing plunge pool. Nice picnic areas, campsites and solar-powered showers are covered in the shade from tall fum trees. Fun activities are swimming in the plunge pool or hiking on the steep trail to the top of Gunlom Falls. 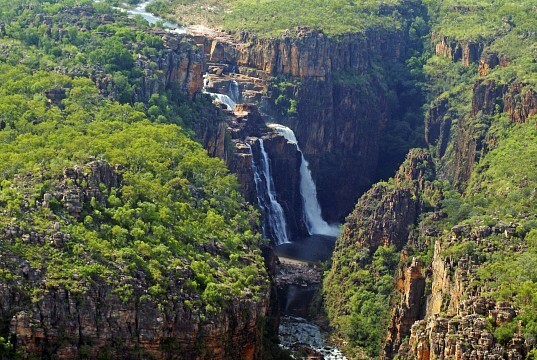 The views from the top are spectacular and include large areas of the southern part of Kakadu National Park. The easy and flat hike to Murrill Billabong is scenic and nice for bird watching. Maguk Plunge Pool can be reached via a 2-kilometer walk through monsoon forest. 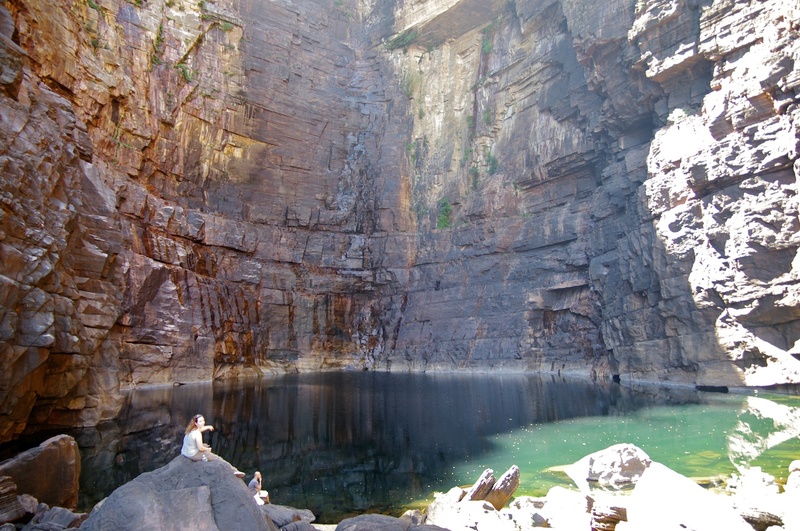 The scenic Maguk/Barramundi Gorge is made up of a small waterfall and a series of small pools. Visitors can hike to the top of the waterfall for great panoramic views. Another strongly recommended wet season activity is the Yurmikmik Walks. A series of connected hiking trails, the Yurmikmik Walks lead hikers to several swimming holes and waterfalls in the south of Kakadu National Park. 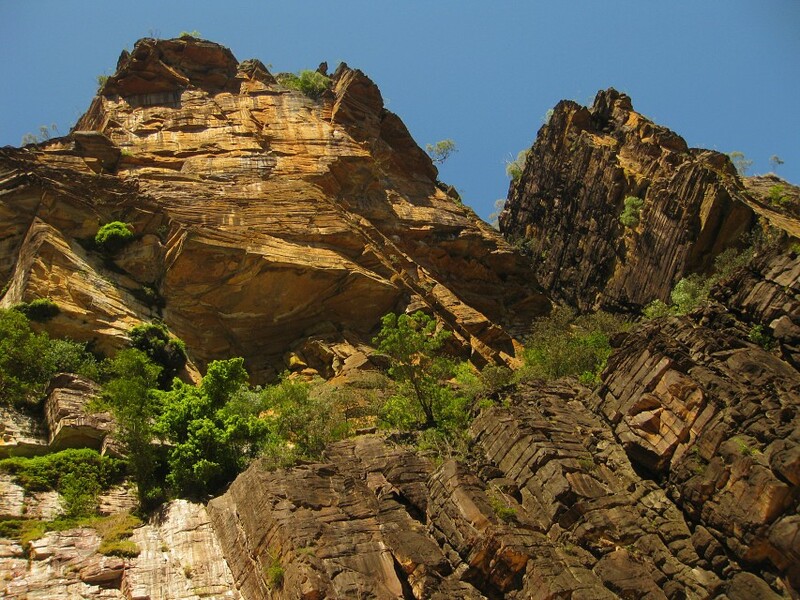 Individual hikes are Boulder Creek Walk, Yurmikmik Lookout, Kurrundie Creek Walk and Motor Car Falls. 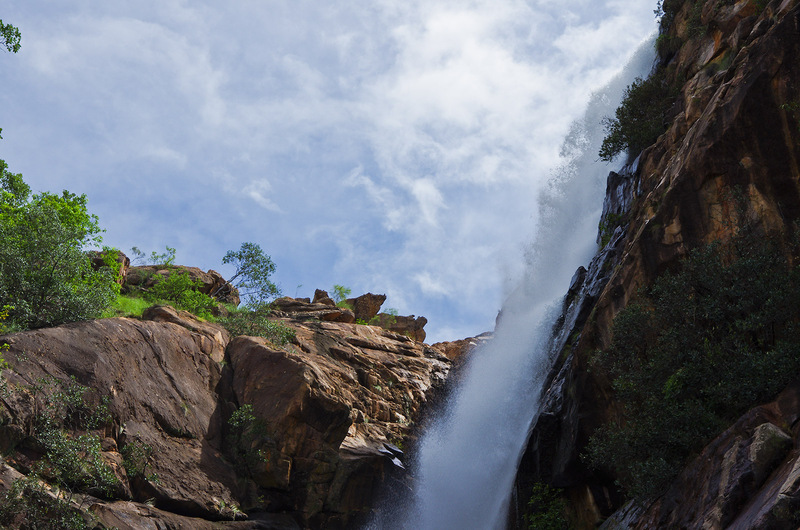 These waterfalls and hiking trails are generally open all year round, in contrary the areas around the national park's larger waterfall, which can be closed in the wet season. Not a waterfall, but another major water landmark in Kakadu National Park is Yellow Water Billabong. This large waterhole lies near the village of Cooinda. Each year during the wet season the billabong floods and connects to other waterways in the area and it is a permanent waterhole in the dry season. This attracts a plethora of wildlife, such as millions of migrating birds, sea eagles, crocodiles, wild horses and many, many more. 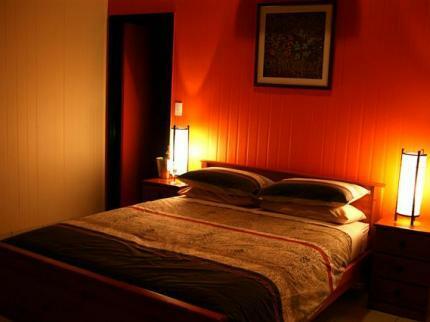 Visitors can see the billabong by boat cruise or enjoy a phenomenal sunset from the viewing platform. 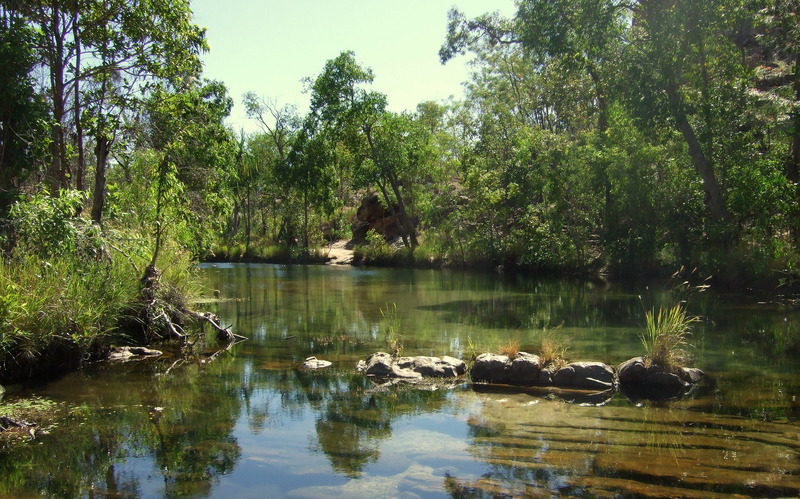 Hikes in the Yellow Water Region include the Yellow Water Wetland, Mardugal Billabong and Gungardun Walks. The sheer size of Kakadu National Park means that there are also many options for activities and many things to see. Being home to the largest concentration of Aboriginal rock at on the planet, one of the major highlights in the park are those ancient drawings and painting. Ubirr Rock offers one of the greatest examples of X-ray art and is a world-renowned site. 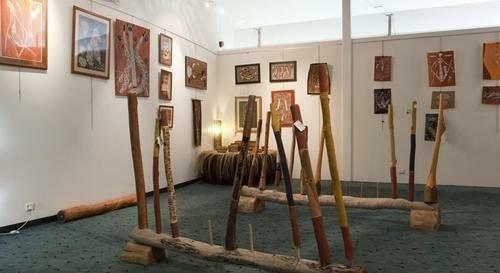 In other places, visitors can observe prints of animals, people, and Dreamtime characters. Other sites contain stone tools and shelters. Nature’s Way is a fantastic drive that runs from Darwin through wetlands and towards Kakadu National Park. It continues past this park to other national parks in the area, such as Litchfield National Park and Nitmiluk National Park. It is a great way to explore Arnhem Land and participate in activities such as hiking, canoeing, wildlife watching, and swimming in billabongs. The national park offers a dazzling variety of activities. Visitors can explore the park on foot on numerous hiking trails, go camping, swimming, and see waterfalls. Crocodile tours and scenic flights are popular activities well. Kakadu National Park can be reached by either bus or car from Katherine and Darwin. From Darwin, the park lies about 149 miles southwest along the Arnhem Highway. The recommended way to visit is by car though. 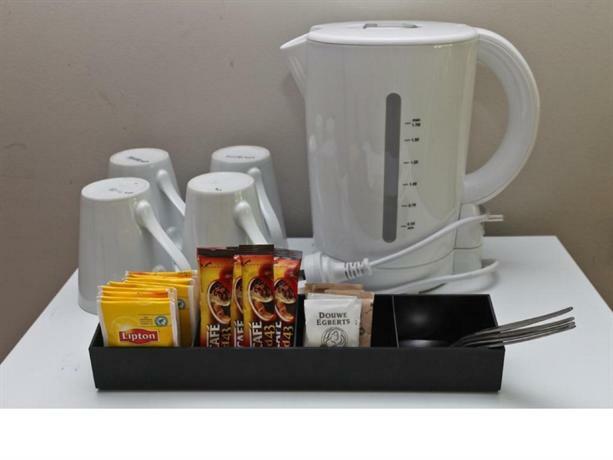 Visitors are advised to fuel up whenever they can, as fuel stations are scarce. 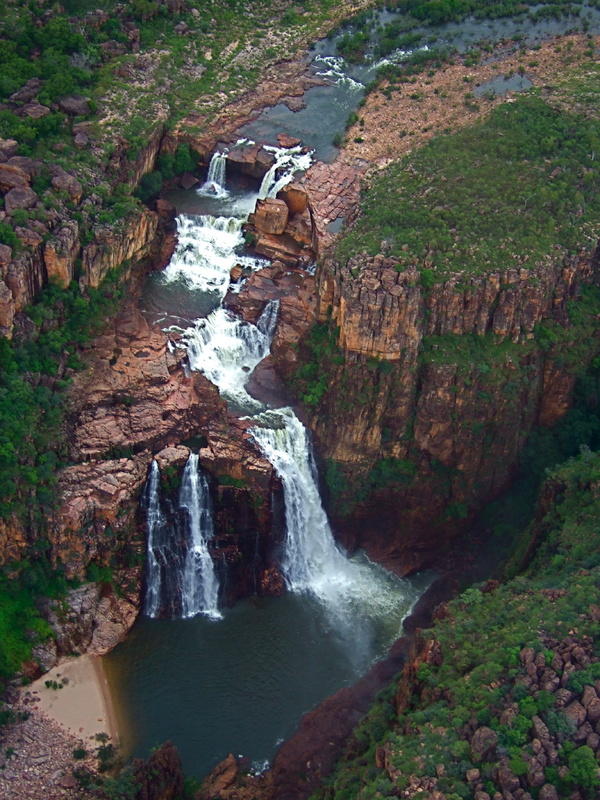 Neighboring national parks are Litchfield National Park, Finke Gorge National Park and Nitmiluk National Park. Further west lies the spectacular Purnululu National Park.